The dried rhizome of Zingiber officinale (family Zingiberaceae), known in commerce as Jamaica ginger, African ginger, and Cochin ginger The outer cortical layers are often either partially or completely removed; used as a carminative and flavoring agent. /gin·ger/ (jin´jer) the leafy herb Zingiber officinale, or the dried rhizome, which is used as a flavoring agent, in the treatment of digestive disorders, and to prevent motion sickness. an herb native to the tropics of Asia and now cultivated in the tropics of South America, China, India, Africa, the Caribbean, and parts of the United States. uses It is considered safe when consumed in food. Medicinal amounts of the herb are used for nausea, motion sickness, indigestion, and inflammation. It does appear to be effective against motion sickness but does not help treat nausea from other causes (e.g., opioid analgesia, chemotherapy). Its efficacy as an antiinflammatory drug has not been established. contraindications It is not recommended during pregnancy (it may be an abortifacient when taken in large amounts) or lactation, in children, or in those with known hypersensitivity to this product. It should not be used in cholelithiasis unless directed by a physician. Safety when large amounts of ginger are ingested for medicinal purposes has not been established. A deciduous plant rich in volatile oil, with borneol, camphene, cineol, citral, gingerols, shogaols, zingerones (phenylalkylketones) and phelandrene. Ginger has a long tradition as a health food, and its various uses include: as a digestive aid; to prevent nausea due to motion sickness, morning sickness or chemotherapy; for cardiovascular disease, as ginger reduces cholesterol; and it may be useful in preventing cancer. Ginger is a fixture in Chinese herbal medicine: the rhizomes are antiemetic, cardiotonic, carminative, rubifacient and stimulate secretion, and it is used to treat abdominal pain, burns, colds, hangovers, hypercholesterolaemia, motion sickness, pancreatitis, Raynaud phenomenon, nausea, seafood intoxication and vomiting. Ginger has been used in Western herbal medicine for arthritic pain, earache, gout, headache, kidney conditions, menstrual cramping, motion sickness, sinusitis and vertigo. 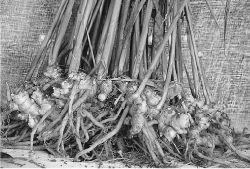 The dried rhizome of Zingiber officinale, known in commerce as Jamaica ginger, African ginger, and Cochin ginger. The outer cortical layers are often either partially or completely removed; used as a carminative and flavoring agent. Zingiber officinale; parts used: roots; uses: stimulates digestion, colic, flatulence, nausea, indigestion, expectorant; precautions: none known, but long-term use of large doses can aggravate heat sensitivities. produced from the rhizomes of Zingiber officinale; used as a carminative, stimulant and antiemetic. The airline's present route network comprises of 10 cities - Abu Dhabi, Peshawar, Lahore, Chittagong, Dhaka, Cairo, Kathmandu, Calicut, Doha and Jeddah. In a similar status, passengers to Calicut from Sharjah are also stranded at the Sharjah airport. RAK Airways offers five flights a week to Calicut departing from Ras Al Khaimah International Airport. com; through phoning a 24-hour call centre on 971-7-2075000; through sales offices in Ras Al Khaimah, Dubai, Sharjah, Ajman and Umm Al-Quwain as well as Calicut and Jeddah; and through travel agents. corporate communications of the airline were part of the Omani delegation to Calicut. Ajeeb Jamal put the brakes on the run flow by bagging three wickets, but UAE all-rounder Shah, batting at No 7, hit a 31-ball 52 with four boundaries and two sixes to steer Calicut to 182 for six from their 20 overs. 40 pm, was cancelled after the pilot called in sick at the Calicut International Airport in Kerala. Since the announcement of RAK Airways re-launch last month, interest in our Calicut route has been overwhelming with passengers from across the emirates and India wanting to avail of our value offering," said Omar Jahameh, RAK Airways CEO. In the opening match of the KCL, Mustafa had cracked an unbeaten 46 and bagged two wickets to steer Calicut to a five-wicket win over Idukki Icons. Calicut's Hafeez Kaleem hit two sixes and three boundaries to give Calicut a blazing start, before Adnan struck twice in quick succession.